Ever since the introduction of the the import video feature for GoPlus users of GoAnimate people have thought about the possibility of creating Roger Rabbit style animations, combining live action people with cartoon characters. I first attempted this when the video import feature was introduced with my animation TET's PA Video Test. In that animation I simply overlaid cartoon elements and characters in front of the video. It worked reasonably well. However to truly combine live action people with cartoon characters you need to be able to place the cartoon background and characters behind the live action video as well. To do that you need either a blue or green screen to combine the cartoon and video together in a technique known as chroma keying (more commonly referred to as 'green screen' or 'blue screen'). Watch my test video below to see my completed example using GoAnimate. Note that I recorded the video with a really short time frame to get it done so I pretty much just said some words off the top of my head. 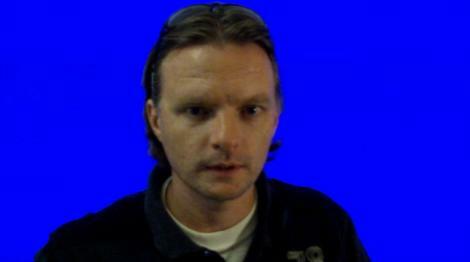 Chroma keying is actually not that hard to do in theory. However the wider the live action area you want to film the harder it becomes to light the scene evenly. I'm getting ahead of myself though. Before you do anything you'll need some video editing software that supports Chroma keying. I use Magic Movie Edit Pro 10 but the software is now up to version 17 and still very affordable at just US$59.99. It's great as an all round video editor too. Next you'll need to grab a video camera and record some footage of your actor in front of a blue screen (or green screen, either colour will work fine. Just make sure your actor isn't wearing either blue or green unless you want them to be see through). In the image below you can see my very, very, very make shift blue screen set up using a bed sheet and a bunch of desk lamps. 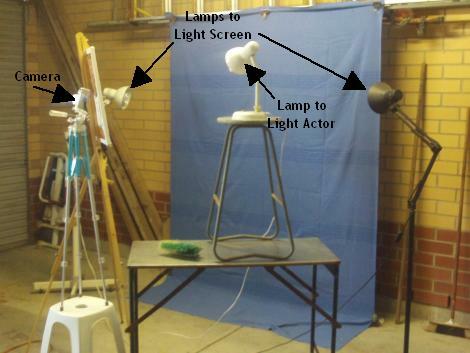 You'll need this kind of set up if you want to film your actors entire body for your animation. Note that this set up wasn't really adequate as the desk lamps weren't strong enough to light the screen evenly. Industrial halogen lights work best. When lighting your screen you need to set up ﻿your lights so they remove all shadows from your blue screen including the shadow cast by your actor. The lights on the screen should be behind where your actor is standing and angled towards the screen. What you're going for is an even shade of blue over the whole screen. You will need at least one light to light your actor as the lights on the screen behind them will throw their face into shadow. Any lights on your actor need to be placed to the sides so that they don't cause a shadow to be cast on your blue screen. If you only need to film a head and shoulders shot of your actor (as I did in the above animation) and you have a large plasma TV then the TV will make a great, evenly lit blue or green screen. This is what I used for my blue screen. I got the idea from youtuber, richw4. His instructional video is embeded below. He also shows you how to use the footage you record in Sony Vegas. The beauty of this set up is that you don't need any lights for your screen as a TV is effectively just a big light bulb. However you may need an additional lamp or two to light your actors face - which I did. If this is the case then make sure you don't get any reflection from your additional lights in your TV screen. When I finished filming my footage for my video it looked like this still from my video below - notice how evenly the blue colouring of the screen is. This is pretty much a perfectly lit blue screen. Using your video editing software and the Chroma key effect you can easily replace all that blue with anything you like, a still image or even moving video etc. 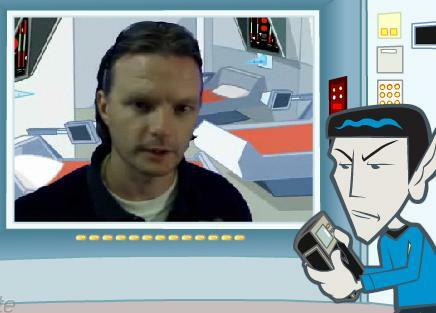 For my video I simply took a snap shot of the Star Trek sick bay background. Imported that into my video editing software then rendered the combined video to a .wmv (Windows Media Video) file. I then uploaded that to GoAnimate and then overlaid the View screen and animated Spock on top of that in the studio. If, for example, I wanted to have Doctor McCoy come up behind me in the sick bay I would have had to have made a separate animation of just Doctor McCoy in the sick bay walking towards the camera. I'd then have to download that video and import it into my video editing software to combine with my blue screen footage of me. I'd then render the combined footage of me with Doctor McCoy walking up from behind out to a .wmv file, upload that to GoAnimate... hopefully you get the idea. It all sounds very complex but if you're prepared to do all the work you could make some pretty impressive animations that are bound to make people sit up and take notice - my test animation has received over 14,000 views to date and it's not even that great! On a similar note, even if you don't have a big screen TV there's plenty of ways to improvise. Perhaps you don't want to film yourself or your friends to put in a video... what about filming toys and combining them with animation? Below is a really rough video I made using my laptop computer as a green screen and a Lego Knight on a horse. I'll admit it's not perfect by any means but it does show that you can experiment with chroma keying with a bare minimum of equipment.